Amy Cheng was born in Taiwan, raised in Brazil, Oklahoma and Texas. She received a BFA from the University of Texas at Austin, and an MFA from Hunter College, City University of New York. 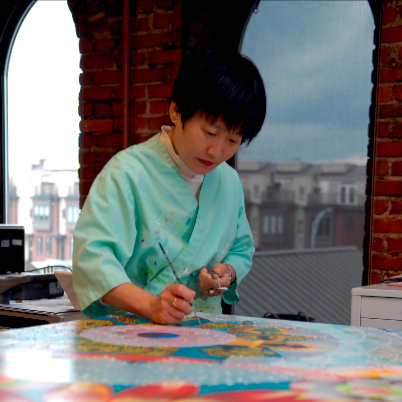 She has exhibited her paintings both nationally and internationally and her work is held in a number of corporate and public collections. She has completed a number of public art commissions including a mosaic column at the Seattle-Tacoma International Airport, a painted ceramic mural at the Howard St. El Station in Chicago, IL, faceted glass windscreens at the Cleveland Street Subway Station in Brooklyn, NY, and laminated glass windscreens at the 25th Avenue Subway Station in Brooklyn, NY. She also installed ceramic tile murals at the Lambert-St. Louis International Airport MetroLink Station and a mosaic mural at the Jacksonville International Airport in June 2013. She received a P.S. 122 Painting Center Fellowship in New York City for a ten month residency in 2011-12, and a Senior Lecture/Research Fulbright fellowship to Brazil in 2008. She has been awarded two New York Foundation for the Arts Painting Fellowships, and an Arts International travel grant to China. She is a Professor in the Art Department at the State University of New York at New Paltz.